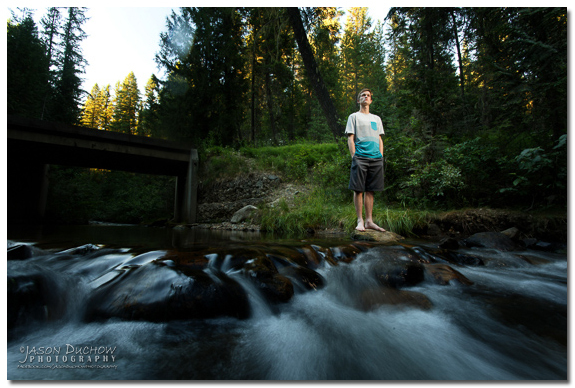 I recently worked with Zach on some senior portraits at one of his families favorite camping locations north of Priest River, Idaho; when we arrived at the location I did some scouting around and when I saw this stream with water flowing over the rocks I immediately began thinking about the classic look of motion blurred water that we all love to see in landscape photography. This look has been around for ages and it is not extremely difficult to achieve, it requires the use of a tripod to steady your camera and a long shutter speed. Depending on how slow you want your shutter speed to be the use of a Neutral Density filter is often required. If you are not familiar with Neutral Density filters they simply reduce the amount of light that enters the lens while not effecting the color of that light. They come in many different sizes and densities, I personally carry with me a 3 stop and a 10 stop filter. I use the 3 stop filter all the time for portrait work but the 10 stop hardly ever comes out of my bag as it is good for long exposure landscape photography and I don’t do that very often. As I said, getting motion blurred water in landscape photography is not extremely difficult, but my goal here was to accomplish this technique while also taking a portrait of a living, breathing person. The problem that this creates is that people move and thus it can be very challenging to have your main subject, the person, sharp while also accomplishing soft flowing water. The first thing I did was test my settings to see if I would be able to get proper exposure for both of my subjects. I found that in using a 3 stop ND filter, a 1/2 second shutter speed and an aperture of F10 I would be able to get the motion blur that I wanted and thankfully we were able to get enough light out of my strobe to also light Zach at those settings. There were two factors that contributed to Zach being sharp in the photo. The first, and by far the most important was that Zach had to be perfectly still while the shutter was open. I made sure to communicate well with him for each shot so that we could take as few frames as possible. The second thing that contributed to his sharpness was the strobe itself. The camera senor picks up light and the most dominant light on Zach was created from the strobe which had a flash duration that was much faster than the shutter speed itself. Since it was a fairly dark scene the light from the strobe helped to offset any minor movements that he may have made in the 1/2 second that the shutter was open. My assistant did not have the Gopro along to capture any behind the scenes video, but he did have his cell phone, the quality is not great, but it will work.